Note: if you are getting one, make sure it's bigger than 1GB. THE COST OF smartphones has fallen, but normally that reduction in price usually signals a downgrade in certain areas. It could be processing power, camera hardware and storage space. Thankfully, the latter can be fixed (in most cases) by getting a micro SD card. While you can easily get a 16GB micro SD Card pretty cheaply, there are a few things to consider first before parting with your cash. What phones can use them? As a rule, most Android and Windows Phone devices include a micro SD slot, usually located beside the SIM card slot on the back or side. Some phones don’t have it, but it’s pretty easy to check whether there is one or not (Remember it’s a micro SD card you’re looking for as a regular SD card won’t fit). If you’re an iPhone or iPad user, you’re out of luck unfortunately as neither device has an SD slot. The first thing people will look at is space and price. 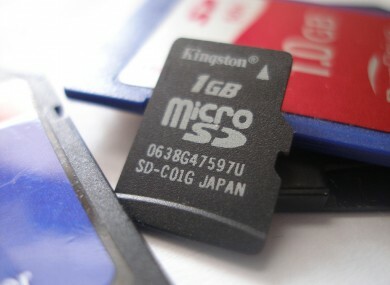 MicroSD storage can range between 8GB – 128GB and cost between €10 – €100 depending on the card quality and space you require. For most people, 16GB or 32GB will be the most space they require, and the more you take photos and record videos, the more space you will require. In saying that, the most important factor to consider is class which determines the speed in which a SD card can transfer data. The higher the class, the faster the phone will be able to read and write data to and from the SD card, and is important if you want to capture HD photos/videos. There are other factors like micro SD cards which are shockproof, waterproof or temperature proof, which can be handy if you want to use it for the long haul. What should I be aware of when using one? The obvious problem is that any data saved on your phone is going to be split between two locations, the internal storage and the SD card. If you’re not swapping out your micro SD card, then this won’t be a major problem, but while your phone will recognise the card, you still need to set up your phone so that it saves photos and videos onto it. Also, you can transfer data from your phone onto your micro SD card, which is useful if your phone fails as it won’t be affected. The final thing to keep in mind is that removing a micro SD card is similar to removing a USB memory stick on your computer. For the most part, it’s simply a case of going into your phone’s storage and selecting ‘unmount SD card’ before removing it physically. It’s recommended that your phone is switched off before you remove or add a micro SD card to your phone. Practically any major electronics or camera store really. Finding one to buy is pretty easy although you shouldn’t automatically opt for the cheapest version. Going for a trusted brand like SanDisk or Samsung is a better choice since the speed class is normally higher and protect against other factors like water, temperature and other factors. Email “Getting an SD card to increase phone storage? Here's what you need to know”. Feedback on “Getting an SD card to increase phone storage? Here's what you need to know”.